Today was a quiet day for deliveries, however we did have 2 large orders. 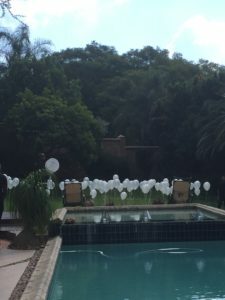 Our afternoon was spent setting up at a wonderful venue in Northcliff (House Higgo). 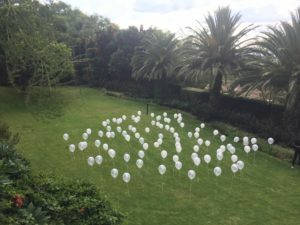 100 Satin Pearl white and Satin pearl Pearl latex balloons were tied to steel pins and these were pushed into the lawn.